This vintage 1930's dress (from Female Hysteria Vintage) is definitely one of the dreamiest things I own. It's made of light-as-air silk and the mint color makes me unreasonably happy. I was saving it to wear when the weather doesn't require tights but I just couldn't resist... and I have to admit I relished the challenge of layering it up for the cold weather. Francesca took these photos as we ventured downtown to check out the lovely new things at Zara (I bought a dress and a cardigan, oops) and search for the perfect shade of light pink nail polish (mission not yet accomplished). We also went to Barneys to ogle the Celine bags, smell expensive candles, and pet even more expensive clothes. Left empty-handed but I do enjoy seeing pretty new things and wondering who might give them a home. P.S. That yucky red mark you can spot on my wrist in several photos is the sad result of burning myself on my clothes steamer. Womp. oh, I LOVE the pics with the contrasting colors, quite an unexpected combo, but lovely! The colour of this dress is absolute perfection. Love it! pretty dress!! That color is gorg-eous! Stunning! 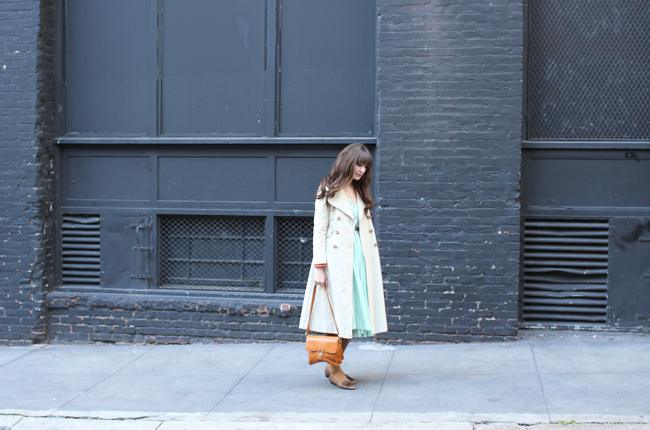 Love this mint colored dress...especially paired with your trench...great photos, you look beautiful! Effortlessly beautiful. I love this color combo! I just love everything mint green! This dress is so gorgeous. i was gonna ask what happend to your wrist! steam can be a cruel thing! i love your color combo here! I love this minty green color on you! 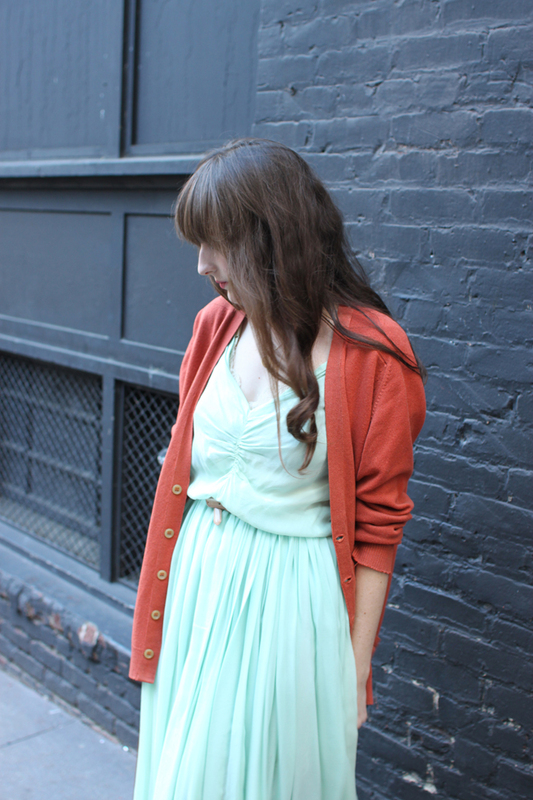 I would never have thought to pair it with that color cardigan, but it totally works - I love it! you my dear are not afraid of color! so beautiful! you're so adorable. I want to grow my hair out and get front bangs again. I love this color combination! mint and rust together, i never would have thought to do this but its beautiful! ouch! You look so beautiful!!! That dress is so dreamy! 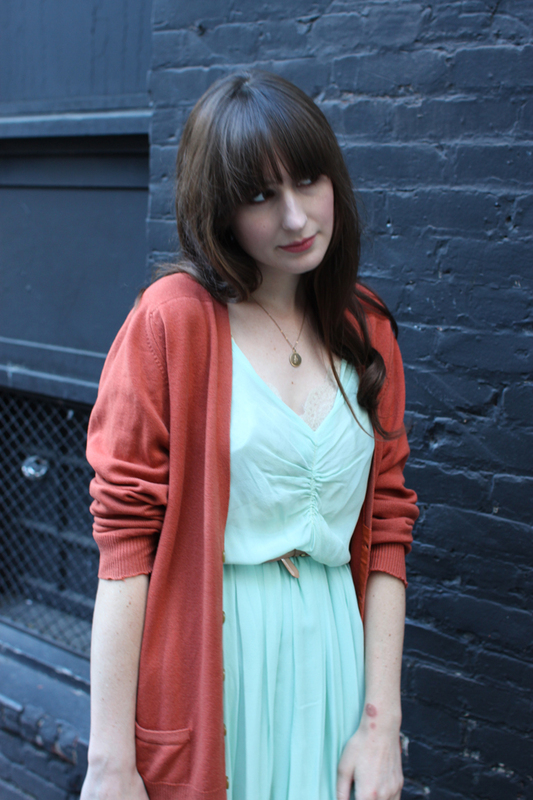 The rust cardi goes perfect with it. 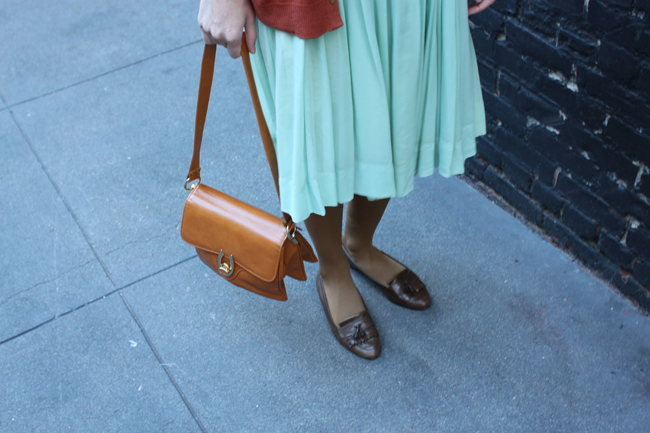 wow, that color green is almost addictive to my eyes, it's great paired with the burnt orange sweater. hair looks awesome, too.styling tips? a pale pink polish you might like is "pop art pink" by essie. I was on a similar quest for a long time til I found that color, it's a very 50s type pink, not quite bubblegum though. ha i was going to ask about the sad little red mark! beautiful color combination in this outfit, and i adore that dress. you look gorgeous. sooo dreamy! what perfect color combo you've got. and check out essie for perfect light pink polish! I was wondering about the mark...who knew clothes steaming could be so dangerous? 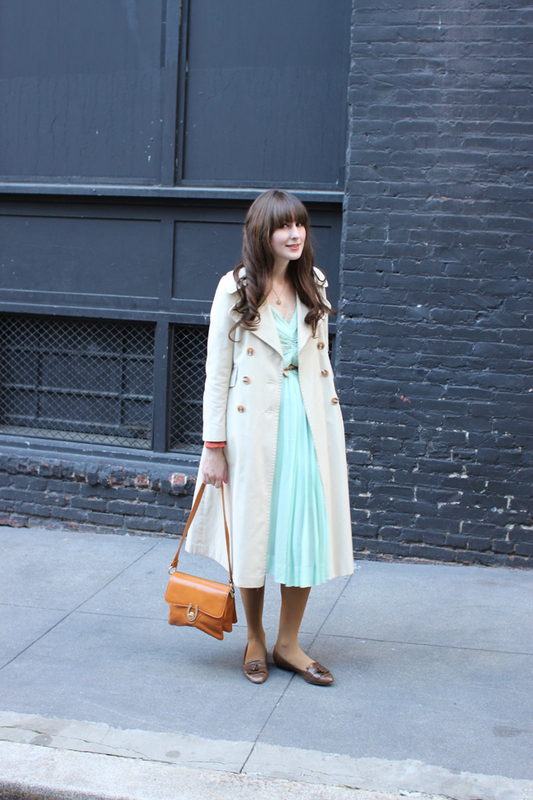 That dress is such a lovely shade of mint, and I love how you styled it with so many layers! Oh it is gorgeous - so delicate! I love the way you mix is with rust and mustard! It definately winterizes a spring dress. I am also rather jelous of your hair - those sweet rag curls make me want longer locks! aah the dress is so fresh and pretty.such a perfect combo! love it! Wow, the dress is gorgeous! Ouch, sorry to hear about the burn, oh my goodness. I can see why this dress makes you unreasonable happy. Your entire outfit IS absolutely dreamy. I *love* this look! That dress is gorgeous and those colors are lovely together. Such a great outfit and adorable photos. I love your blog, it's so cute. Yikes, those look like quite the burns! :( Sending healing vibes your way. I can't tell you how many times I've accidentally almost burned myself with the clothes steamer... Once when I worked at Peet's I mistakenly turned the steam jet of the espresso machine on right above my hand. Soooo bad. You look like a doll you are so pretty !